There are few things in life as glorious as fresh, warm, tender bread. Ok, at least on the food side of life. Why is something so universally simple always so appealing? I think it boils down the simplicity and elegance of a few traditional ingredients combined with the smell and nostalgia. Oh that smell. 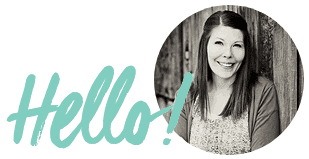 I have lots of bread recipes here on Bless this Mess. My favorites are Rustic Italian Bread, clover rolls, and this awesome 100% whole wheat bread recipe. Rolls and loaves are pretty normal, but every now and again I try something different. 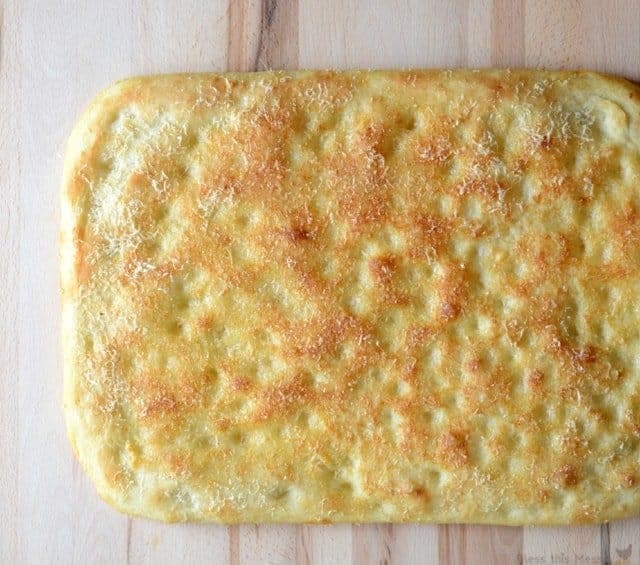 Case in point, this amazing Parmesan focaccia bread recipe. I don’t know what the word focaccia really means but in my mind it means “bread heaven”. This bread is light and super tender in the middle but has a phenomenally crunchy outside thanks to baking it in a heavy hand of olive oil. It’s just a fantastic break from the traditional breads that you are serving with dinner and your family will go nuts over it. If you are making a soup that is a regular in your meal rotation, try switching things up by serving this bread on the side. It’ll be like eating a whole new meal. , so you know it’s a good one. ATK doesn’t lead one astray. Make a pan of this amazing bread today… you won’t regret it! In a small saucepan add the cut up potato and 3 cups of water. Bring the mixture to a boil and cook for about ten minutes or until the potato can easily be poked with a fork. Using a slotted spoon transfer the cooked potato to a small bowl and then measure out one cup of the hot potato water and set both aside to cool. Once the potato had cooled enough to touch grate it on the largest holes of your box graters and set aside (this should be about one cup of grated potato that is lightly packed). Add the cooked potato, 3 1/2 cups of flour, 2 tablespoons of olive oil, yeast, and salt to the bowl of a stand mixer. Using the dough hook mix on low speed. Slowly add the reserved potato water (that has cooled to 110 degrees) and mix until it starts to form a dough, about 2 minutes. Increase the speed to medium low and continue to mix until a smooth and elastic dough is formed. The dough should start to pull away from the edges of the mixer bowl but still stick to the bottom. If after 4 minutes the dough is too sticky add the remaining flour as needed just a tablespoon or two at a time until the dough leaves the edges of the bowl. After 8 minutes knead the dough by hand on a clean surface to form a smooth round bowl. Put the dough in a big lightly oiled bowl and let it rise, covered with plastic wrap until doubled, about an hour to an hour and a half. Coat the bottom of an 18 by 13 inch rimmed baking sheet with 1/4 cup olive oil. Using wet hands (so the dough doesn’t stick to you) gently push the dough evenly across the bottom of the pan until the whole pan is evenly filled with dough. Brush the top with another 1 tablespoon of olive oil and then cover with plastic wrap and let it rise until doubled, 45 to 75 minutes. At the end of the final rising time heat the oven to 425 degrees. Remove the plastic wrap and with wet fingertips dimple the entire top of the dough. Drizzle the last tablespoon of oil over the top and sprinkle evenly with the Parmesan cheese. Bake until the bread is crisp, 20 to 25 minutes. Once the bread has baked carefully transfer it to a wire rack to cool (don’t keep it in the pan). Let it cool for 10 minutes. Serve warm or at room temperature. Thanks a million for reading and being here. You guys are the best! 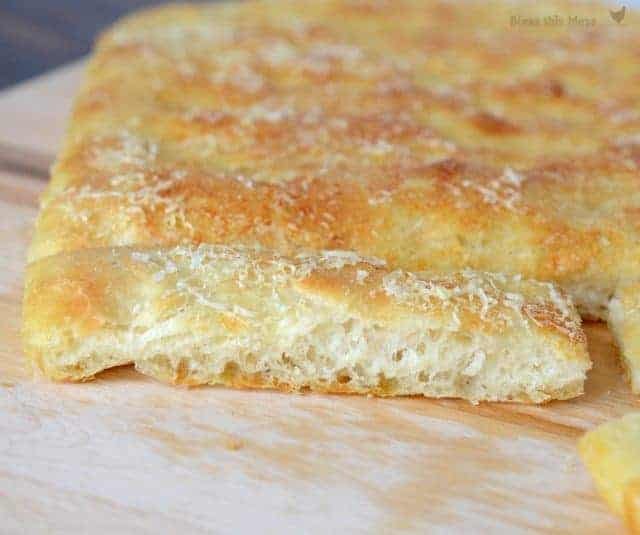 Oh I used to work at a pizza restaurant and I loved our focaccia. I ate it all the time. Thank you so much for sharing this!! Love this recipe. Thanks so much. Looks so yummy! 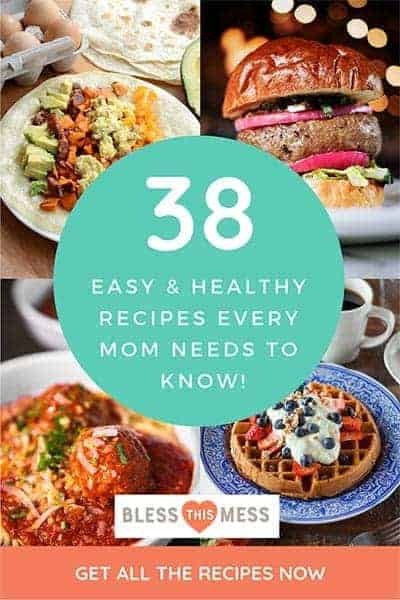 You’re one busy mama! This was tasty, olive-oil yumminess. It wasn’t too much work after you have the potato ready to go… more rising time than anything. It was, however, not nearly as fantastic leftover, especially past a day, so unless I have a LOT of people to feed, I’d go ahead and half it in the future. Completely agree with you! Thanks for the comment Shauna! This looks AMAZING! Will be doing this with creamy carrot soup. It should impress my in laws!! That sounds delicious! Do you have a recipe for the soup? My kids actually love carrots and it sounds right up our alley! Note: when sautéeing the veggies I use fresh ginger; about 1/2 tbsp. Oh wow, yum, slobber, drool……I will make this again and again. Halved the recipe and plopped it into a glass 9×13 cake pan. Picture perfect and super good! I only had a large russet, which made 1.5 cups of shreds. I froze 1/2 cup of the potato water in a canning jar, placed 1/2 cup of shreds in a baggy and stuffed it on top of the frozen water. Hopefully, my next batch of focaccia will be partially ready to roll from the freezer! I am already dreaming of additions to this once the herb garden wakes up!!! Thanks for the great recipe!!! Tell me how the freezing of the tator goes! That’s the one thing that keeps me from making this more often! GREAT idea! I’m so glad to hear back! I can’t wait to try that! Thank you!